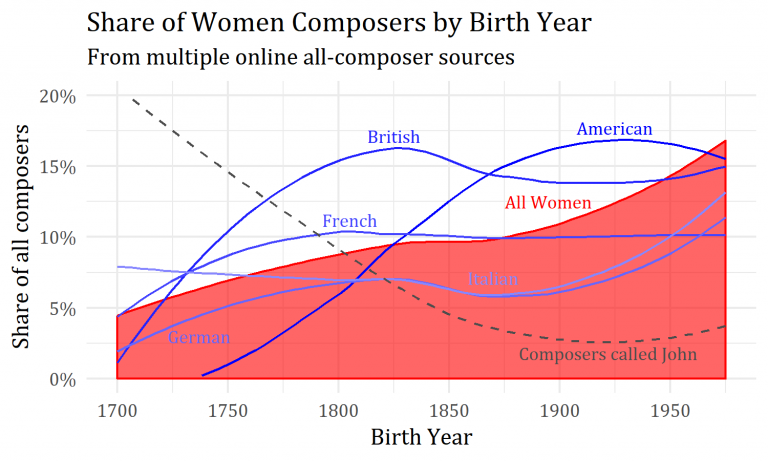 It shows the cumulative number of women composers born up to each quarter-century between 1700 and 2000. 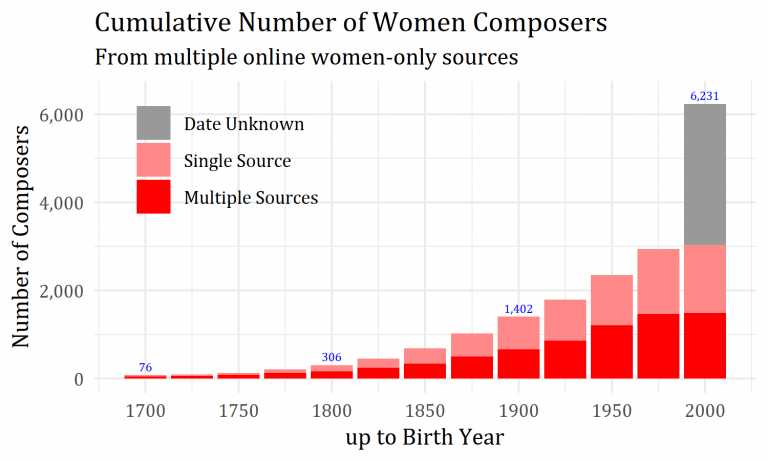 So, for example, there were 306 female composers in these sources that we know were born before 1800. I have split the bars into three categories. The red bars are composers that appear in several sources and for whom at least one of the sources mentions a year of birth. So the pink bars should be a bit smaller than shown because there are probably still some duplicates, and those ‘date unknown’ names, if we knew the dates, would roughly double the height of each bar. So the true figure for 1800 might be more around the 500 to 600 mark. However, there are other reasons for believing that the total here of 6,200 is a significant underestimate of the true number of women composers. Some of you will have encountered the ‘International Encyclopedia of Women Composers’ by Aaron I Cohen, which also, by chance, lists about 6,000 names.7 When you compare my combined list with the Encyclopedia, it turns out that only about a third of the names in each are mentioned in the other. So that takes us up to something like 10,000 women composers – 6,000 in each, less the 2,000 or so that are counted twice. It is hard to quantify these unlisted women composers, but I think it is a substantial number. This overall trend masks some interesting regional differences, shown by the blue lines. In Britain, women have comprised 15% or so of the composer population since the end of the eighteenth century. The Americans caught up with us during the second half of the nineteenth century. The proportion of French women composers has not changed much for the last two centuries. And in Germany and Italy, which have been arguably the most significant musical nations for much of the last 300 years, the proportion of female composers has been noticeably lower than average. Much of the growth in the late twentieth century has come from the rest of the world, particularly the Far East, South Asia and parts of Eastern Europe. The point of including that line was to remind me to mention how we find the women in these general sources, hardly any of which explicitly mention genders. The best approach is to infer the genders from first names.12 There are computer packages to do this quite easily, but it is not 100% reliable.13 Many old names – Hildegard, for example – are not included in the databases used for this sort of classification, which date mainly from the nineteenth and twentieth centuries. There are also a few ‘unisex’ names, especially when they come from different countries. For example, I had to make a manual adjustment to avoid all of the French ‘Johns’ being classed as women composers. This shows the distribution of article lengths in Oxford Music Online for male and female composers.14 Note the logarithmic x-axis, where each step represents an article double the length of the previous one. 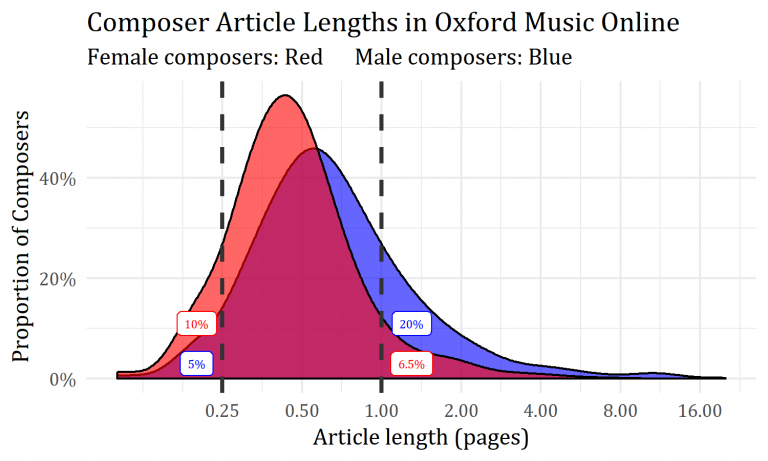 On the left we have the very short articles – 10% of women composers have an entry of less than a quarter of a page, but only 5% of male composers do. On the right, 20% of men have more than a page, but only about 6½% of women do. The average article length for men is in fact almost twice that for women. The four longest articles on women in Oxford Music Online – between 4 and 8 pages – are for Ann Southam (1937-2010, Canadian electronic and classical), Clara Schumann, Hildegard of Bingen and Johanna Kinkel (1810-1858, German).15 This puts them on a par with men like Bohuslav Martinu, Anton Reicha, Josef Suk and John Field, and there are many other men with much longer articles than these. This is just one illustration of a persistent difference between male and female composers. We know less about women than their male counterparts, they have received less attention from musicologists, and their works are less likely to have survived. Another important difference between male and female composers is in the type of works they wrote, as illustrated by the fourth slide, which is actually six small charts. This slide uses data from over 30,000 works selected from IMSLP using its ‘random page’ feature.17 It uses the various genre-related tags that are associated with each work to plot the differences between male and female composers. These are just a few of the tags with the most significant differences, analysed by birth year and gender. On the top row are three tags which are more common among female composers – ‘harp’, ‘voice’ and ‘keyboard’. On the bottom row are ‘strings’, ‘chorus’ and ‘orchestra’ – tags that are less likely to appear in works by women. This supports the fact that women tended to focus, more than men did, on small scale works for domestic performance, and were less likely to write music for large forces and public performance. Hopefully these slides have given you a flavour of the sort of thing that can be done with statistics in studying music history, and some of the methodological and data issues that can arise. Hopefully it has also increased your knowledge of women composers. Cite this article as: Gustar, A.J. 'Statistics as a tool in researching women composer populations' in Statistics in Historical Musicology, 14th September 2018, https://www.musichistorystats.com/statistics-as-a-tool-in-researching-women-composer-populations/. This paper was presented at the annual conference of the Royal Musical Association at Bristol University on 15 September 2018. Footnotes and other links were not included in the original presentation. The charts in this paper have been produced using the ggplot2 package in the R programming language. The sources used are the ones listed in this article. The database of women song composers, for example, contains many names that do not appear elsewhere. There are around three names for every two women composers. See this previous article about the difficulties of deduplication. By ‘elsewhere’ I mean general composer sources (i.e. not women-specific), as well as Google searches and other general sources. Further details are in this article. One such example is Charlotte M E Oliver, who was, according to Hofmeister, the most published British female composer in nineteenth century Germany. She is discussed in this article. Another example is Carlotta Cortopassi, with a single work listed by Pazdírek – see here for the latest news. It was actually the same general list created for the investigation into British composers listed by Hofmeister. The main sources are listed in footnote 3 of that article. The list contains over 53,000 composers, of which 78% have a known birth year, 95% a nationality, and 96% a gender. Note that all of the charts in this article show smoothed curves for easy of legibility. The raw data produces rather more wiggly lines, of which these smoothed versions are essentially moving averages using LOESS regression. There are some other approaches that can also be useful, such as searching for the word “he/she” or “his/her” early in a biographical article, or looking for gendered titles such as “Lady” or “mlle”. One example, used for this analysis, is the gender package for R. There are several others, making use of various historical and modern datasets. The data is based on several previous investigations. A ‘page’ here is an arbitrary unit based on the text that fits roughly onto a computer screen. The article lengths only cover the biographical articles, and exclude images, references and work lists. The first and last of these are perhaps unexpected, and seem to be due to the authors of these articles being rather more thorough than most. This is related to the point mentioned earlier about the high number of ‘single source’ women composers. 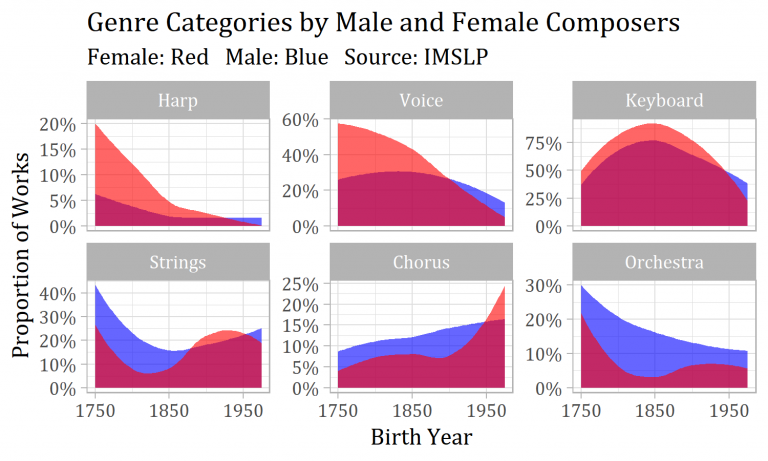 Musicologists appear more likely to go out of their way to find unknown female composers than to track down their more numerous male counterparts. A computer program used the ‘random page’ to find (after removing duplicates) 31,648 works from 8,098 composers (including 754 works by 210 women), and to record various details including their genre-related tags. There is a roughly 70-year period after a composer’s death before works come out of copyright and the score can be submitted to IMSLP (the details vary by country). More recent works on IMSLP may be simply listed, but with no score, or have been submitted by, or with the agreement of, the composer. This is a difficult judgement to make. Those composers (mainly male) who made their living from composing obviously tended to write more works than those to whom financial success was less important (including most women composers). However, among those who were not obviously commercially successful ‘big names’ there is no evidence to suggest a difference in productivity between the sexes.